that were anchored in the bay due to shallow waters at the pier. We took this photofrom our tender which was much larger with a double deck and steep steps to the 2nd level where we sat during the 30 minute ride. The beach at our cottage on the Caribbean Sea. 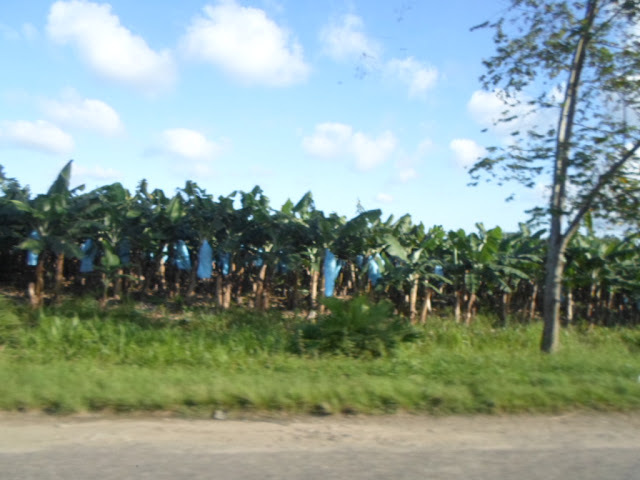 A banana plantation along the Hummingbird Highway. The blue plastic bags are used to protect the banana from insects instead of pesticides. ﻿ A few years ago, I had trouble going to a Minnesota Twins ballgame, the ride in the car, sitting in the bleachers, the stairs up and down. I was falling apart. Now, less than two years later, I'm hauling my share of carry on bags, up the steep steps to the second level of the tender for a 30 minute bouncy boat ride in choppy waters from where the Celebrity Equinox anchored out at sea, too large to dock at the pier. Thank goodness for discovering that food played a huge role in my chronic pain syndrome, now all but gone, making it possible for me to be a participating partner in our upcoming years of world travel. For this, I am very grateful. However, my newer state of being doesn't diminish my persistence in getting things done and getting them done right. This morning, still on the Equinox, with all of our bags packed and ready to go down to deck two to await our departure on a tender, we waited to hear from the Celebrity's Immigration Officer, Jennie. 1. Acquire visas for us for at least the one month Belize offers with the availability of applying for the remainder of our stay. 2. Get us and our bags safely off the ship on time to meet our private shuttle driver Abraham at our prearranged 12:30 PM at ship terminal #2 who'd be waiting for us holding a sign with our name, to begin the four hour drive to Placencia to our awaiting little beach house. 3. Avoid us standing in a lengthy line behind all the passengers who were going on excursions in Belize City and avoid all the passengers waiting for us to get our luggage loaded on the tender. Passengers didn't have luggage, just purses and bags to carry the loot they'll purchase on shore. We each had heavy computer bags, Tom's two liter duty free bottles of booze, bottles of water for the road trip, my overloaded handbag and a heavy bag with all of our prescriptions and preventive medicines that I always keep in my possession. While I was at the guest services awaiting our stamped passports Tom was upstairs in our cabin on Deck 10 lining up the luggage for the soon-to-arrive porter with a cart to take it to the tender boarding area. If timing went as we'd planned, we'd be at Terminal 2 in Belize City to meet driver Abraham promptly at 12:30, head directly to the Fed Ex office to return the XCOM Global MiFi to San Diego and begin the long drive to Placencia. At 11:30, Jennie frantically arrived at the desk to tell me our passports were approved by the Belizean Immigration Officer who had come aboard at 10:30 and we were set to go. She handed over our two passports, wished us well and dashed off. Still standing at the desk, I knew I'd better check the passports. The visas on both of our passports read: 6/2/2013. In US speak that means, June 2, 2013. In Belizean speak that means, February 6, 2013. He'd only approved one week!!! Now what? I took a deep breath. Stay calm, I hollered at myself in my head. Summoning a guest services rep to go find Jennie again, I waited impatiently another 10 minutes. Showing her the dates on the passports, she became embarrassed and flustered, mumbling something about the Belizean Immigration Officer having gone to eat at the ship's buffet. In a firm but diplomatic voice, I asked her to please go interrupt his breakfast kindly asking him to extend the visa to 30 days giving us ample time to apply for an extension by mail while in Placencia. Aware of the clock ticking, Tom appeared at my side ready to head down to Deck 2 to our awaiting bags and to board the tender. Moments later, Jennie appeared again with the passports in hand, showing us that she had in fact interrupted his breakfast as he gave us the 30 days visas. Off we went down to the gangplank and boarding area to about 100 passengers in line waiting to board the next boat. Asking Tom to get out our two "Priority Tender Passes" only to discover moments later that most passengers in line also had a "Priority Tender Pass." Oh, how I had thought we were special! Ha! By now, it was noon. Surprisingly, the line moved quickly as passengers swiped their "SeaPass" ID cards into the slot. As we moved up the line, I started asking staff personnel about our luggage. "Where did they put our luggage?" No one answered until we reached the point of swiping our cards in the machine. A loud siren started blaring as soon as my card was read. The same happened to Tom. We were immediately whisked aside to curious onlookers who were trying to assess our "crime" only to discover that they were being alerted to the fact that we were getting off the ship and not coming back. Steps away from boarding the tender we were approved to depart after a phone call was made. I continued to ask about our luggage. "Where is it?" I harped again trying to sound friendly. Tom had already reminded me about my persistent manner to avoid coming across as "the ugly American" making endless demands. A uniformed man appearing to be a police officer for the ship stated with raised brows, "Your luggage went on an earlier tender. Its at the pier waiting for you. "Is someone watching it?" I asked. "Yes, madame, it's in the hands of Celebrity personnel." he reassured us. We boarded the tender hauling our multiple carry on bags to that second story when we barely found two seats next to one another. Squeezed between several passengers, a lively conversation ensued with the passengers around us, fascinated that we were getting off the ship to stay in Belize for over two months. I appreciated their enthusiasm but my mind was on the luggage. Finally I relaxed to enjoy a lovely woman sitting next to me, a world traveler from Germany, an archaeologist. The 30 minute ride flew by, wind and sea spray splashing around us in the open air boat as we chatted on about science, paleontology and the caveman. Quite interesting! I could easily have spent hours with her. Exchanging business cards, we promised to stay in touch via email as she was very interested in reading our blog as I was interested in hearing more about her family winery in Bordeaux, France. As she dashed away, she threw her head back to shout to me, "Come to visit us at our winery in Bordeaux." Whether said flippantly or sincerely, I momentarily relished in the prospect of spending time at her family owned winery. Moments later, we were being herded off the tender all the while looking for our multiple orange bags. After a lengthy walk on the dock, we discovered a Celebrity "tent" with cups of water accompanying the goodbyes from the uniformed staff. Our luggage was no where to be found. The Celebrity staff member who was dressed in a uniform was apparently a police officer who led the way for us to follow him. Madly searching for our bags in the crowded terminal, we also had an eye out for Abraham and his sign with our name. There he was. No luggage. A row of van drivers were desperately trying to move through traffic and get their loaded vehicles on their way. In what was a wild flurry of activity, as Abraham joined us in the search for our bags, there were two vans in front of ours, all blocking traffic. Suddenly, we saw ORANGE!!! Our bags were in a van we had not requested, not Abraham's van! The doors were being shut and it was ready to drive away. We both yelled, "Stop!! Those are our bags!" Stop that van! The van stopped and minutes later, a load of about 25 bags in the rear of a huge van were being unloaded to get to our bags which of course were on the bottom of the pile. The other awaiting van in front of the van with our bags took off with passengers and luggage, on their way to the airport. After unloading the "wrong van" we discovered were missing three large bags, two orange, one black and they were on their way to the airport. It was sunny, humid and 90 degrees. Pushy, pushy, pushy. But, nice, nice, nice. We managed to convinced the other van driver to contact the airport van to turn around in crazy traffic and road construction and come back with our three bags. Yes, our bags ended up in two separate vans, neither of which we had requested or desired. 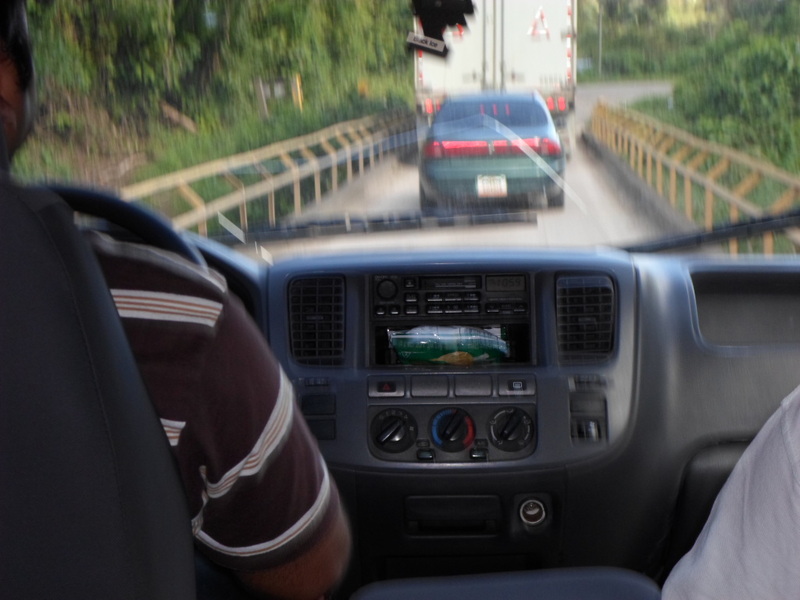 After what seemed like an eternity, we had all of our bags in Abraham's van and we were on our way to FED EX, arriving a good 20 minutes after leaving the ship terminal through bumpy dusty unpaved roads in some of the poorest areas of Belize City. Oh, oh, FED EX had moved. They are now within a block of the ship terminal. We'd have to turn around and go back. "Oh, no," I persisted, "is there a UPS or any other shipping company near us now?" Abraham quickly answers, "Yes! How about DHL?" "Yes!" I chimed in, "DHL it is!" Minutes later we were standing at the DHL desk watching the rep look up rates in an old fashioned book as opposed to a computer. Thirty minutes and $72 US later, we were out the door, insuring the package for $800. And so began the almost four hour drive down the Hummingbird Highway. We went through six, yes six, one car width bridges. We encountered washed out roads, cracked broken pavement, scary single lane passing, slow semi trucks up the steep winding hills, slow drivers, crazy drivers, winding and mountainous roads. We encountered cows in the road, cows in the pasture eating real grass, roaming free, chickens wandering in fields, pecking at natures little tidbits, soft billowy clouds over the sea, endless rows of banana trees and more orange groves than I'd ever seen growing up in California. Endless coconut trees lined the hills and valleys, a lush forest of Mother Nature's untarnished bounty of its fruits of the land. Shortly before we arrived at the cottage, we asked Abraham to stop at a grocery store to get us through the first few days until we figure out transportation. He gladly obliged while we dashed into the little store. Shocked by the prices and knowing there was another bigger grocer a mile from the cottage, we opted to purchase bare necessities, food for breakfast and dinner. Much to my delight, the steaks were local grass fed, from the farm where I had observed the cows grazing, the brown eggs were organic, free range and cage free at $2 a dozen. The produce, although limited in its selection was fresh and had that "just picked from the field" look. When the cashier rung up our groceries, it totaled $114. I was sadly disappointed this small amount had cost so much. Tom nudged me when he saw the look on my face, 'That's Belizean dollars. Its actually about half of that!" At 5 PM, we arrived a the Little Cottage with the good directions provided by the owner. We were tired, hungry and anxious to see the beach house and get situated. We weren't disappointed. The house, situated on the owner's property only requires walking the length of the small ocean front lot to the Caribbean Sea. Today, we'll do laundry, in piles from the most recent eight day cruise which must be dried on a clothes line (no dryer), unpack only what we need, figure out transportation and spend as much time outside enjoying the ocean breezes, the breathtaking scenery and the unfamiliar sounds from birds of unknown origin. Yesterday, I was feeling a little apprehensive about tomorrow's upcoming trip to Placencia, Belize. The almost four hour ride through the mountains on bumpy dirt roads with one way bridges tends to make me slightly anxious. Tom, as usual, is totally at ease. I wish he were driving. He's the safest driver I know and he's been on plenty of one way bridges in his 42 years on the railroad! With the driver picking us up in Belize City at 12:30 for a quick trip to the FedEx store to drop off the XCom Global WiFi, we'll be on our way. We're bringing along our four Contigo mugs filled with ice which usually keeps for hours, one quart of pre-made Crystal Light iced tea and one quart of purified water. In a reply email from the owner of Little Cottage in Placencia we'll be about two miles from a grocery store or restaurant. She suggested we stop along the way to buy some food for dinner until we figure out a form of transportation to get around. Car rentals are $250 a day or more. Golf cart rentals may be our best option. We can rent one for about $27 for three hours. We figured we'd do this at least twice a week so we can go grocery shopping and I can work out at Robert's Grove Hotel gym ($39 a month). If we get the golf cart one morning a week, we can grocery shop and go out to breakfast. The next time, we can get it in the afternoon, grocery shop again and then go out to dinner. We'll figure it out. Also, I sent a request to a local vehicle rental company for a two month rate for a golf cart. They responded saying they'll give us a price by tomorrow. Norman, the owner's property manager, will drive us anywhere for a nominal amount for gas and his time. We can ask Norman to take us sightseeing and to further explore the area. Placencia is far from the tourist hustle and bustle which is exactly what we've wanted although it does have a busy downtown area with shops, activities, restaurants and services. The lifestyle in Belize will be very different from that which we've known and loved: no TV, limited Internet (the cottage has wireless but its unpredictable), no transportation round the clock. We'll adapt. Linda says the water in potable but "it may take time for our systems to get used to it." Does that mean we'll get sick? It might be best to use bottled water. Hopefully, we'll be able to eat uncooked vegetables. Life without salad is hard when eating my restrictive diet. Then again, when we travel to Africa in seven months, lettuce will be out of the picture entirely, along with any uncooked vegetables. Nurse Marsha from the Travel Clinic in Minnesota firmly stated that we should use only bottled or boiled water for everything and to totally avoid any uncooked vegetables including lettuce. Two schools of thought here. Shall we bite the bullet and use the tap water, allowing our systems to "toughen up" even if it means a few uncomfortable days? Or, shall we avoid it altogether as suggested by Nurse Marsha? I guess we'll decide this tomorrow when we arrive. On our second week's dose of the malaria drug, we've relived that neither of us is experiencing any side effects so far. It's now Monday morning. We've had breakfast and we're sitting outside on the shop on the deck off the restaurant each of us reclining on two comfy sofas, a strong warm ocean breeze swirling around us, a fresh glass of iced tea in our mugs. Soon, we'll go back to our cabin to begin packing, much easier this time since we'd only opened a few of the many bags when we began this cruise one week ago today. Today, we'll buy two of the soft beach towels for sale on the ship at $28 each, well worth the price and two bottles of Courvoisier for Tom, liters at $35 each, a good duty free price. Belize allows tourists to bring one bottle of alcohol per person into the country. The ship is swaying due to high winds but after 23 days at sea, we barely notice it. Could we have developed "sea legs?" We both feel that we could cruise indefinitely. Perhaps, down the road we'll encounter a great last minute price on a "world cruise" that lasts for 120 days or more. 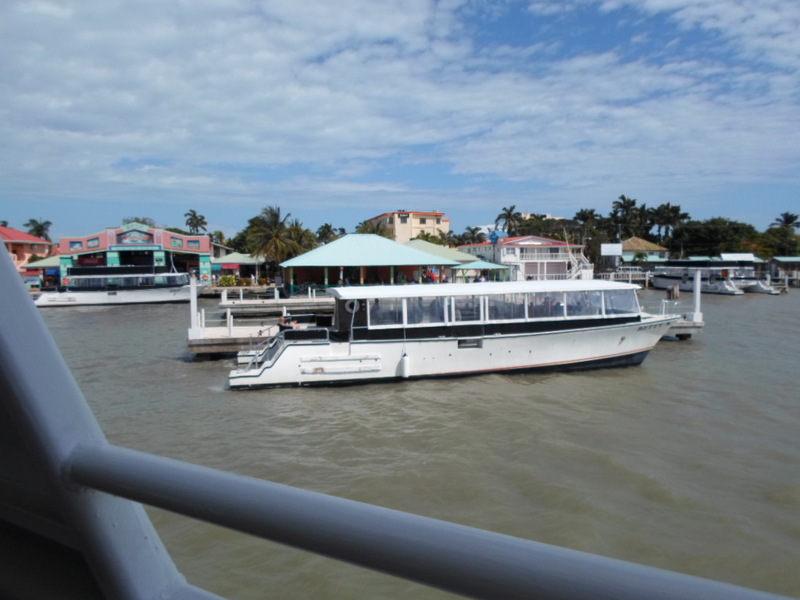 Once situated in Placencia we'll write a review and comparison of the two cruises we've experienced thus far, the Celebrity Century and the Celebrity Equinox. Definitely not experts after only two experiences, we'd love to document our observations while it is still fresh in our minds, coming back later to see, after six more cruises, if we've changed our opinions. We won't be writing here tomorrow as it will be a long travel day. By Wednesday, we'll update you on the process of getting off the ship, our perspective of Belize City, the four hour drive on the bumpy road and photos of our new home, a cottage on the beach in Placencia. The live show begins at 9:00 PM each night in the Equinox Theatre. In order to get a good seat, it's necessary to arrive at least 30 minutes before the show begins. With the majority of the ship's passengers 65 and over, it's not unusual to see folks scrounging for seats as early as an hour before the show. Seating in the Silhouette Dining Room each night between 6:30 and 7:00 PM, we've found we have time to enjoy dinner, the companionship of our "table mates" and a three course dinner with time to scurry off to the theatre for the show. While comfortably seated on bar stools with cushioned backs at a high bar top table, we've had a "bird's eye view" of the hundreds of passengers picking out where and with whom to sit. In itself, that's been entertaining. "People watching" aboard ship can be quite an adventure. Saturday night, we couldn't help but notice an adorable couple, possibly in their 90's, as they managed to find two seats to their liking. We laughed. Hopefully, that could be us in many years. Yesterday afternoon, while cloudy and drizzling while out to sea, we decided to go to the 2:00 PM movie in the Celebrity Central theatre, for the showing of "My Week with Marilyn". Once again, arriving early to ensure a good seat, we perused the room for yet another 30 minutes of "people watching." As the lights went dark, suddenly from out of nowhere, Tom bolted out of his aisle seat so fast, I didn't know what happened. There on the floor lie a little old man, of the couple we'd seen on Saturday. He apparently tripped while maneuvering to his seat in the darkened room and Tom with his hawk-like ability to scan the room, moved so quickly to assist him, it was startling. He reach the old man about 15 feet away in but two seconds flat, checking out his condition as he lay completely flat on the floor, helping him to arise after he insisted that he was uninjured. Thanking Tom profusely for his prompt assistance, he was able to sit through the entire movie. When the movie ended, Tom again, dashed to the old man to see how he was feeling asking if he'd like further assistance. This incident, luckily without injury, reminded me of how safe I feel with Tom at my side. No matter my apprehension or fear, he's at my side offering loving reassurance and comfort no matter the situation. His quick responses and ability to "think on his feet" put my mind at ease knowing he will be at my side through any "out of the box" experiences we may have along the way. So... bumpy, mountainous, narrow road with single lane bridges, here we come! I'm ready for you! Remember our motto, "Wafting Through Our World Wide Journey with Joy, Simplicity and Ease"? We strive to keep this in mind. In order to accomplish doing so, we must be proactive. On occasion, proactive behavior requires assertiveness that may, on occasion, be off-putting to those with whom we are dealing. 1. How will our luggage be handled on the smaller "tender" boat taking us the 20 minute ride to the pier in Belize? Will we need new luggage tags as when we disembarked the Celebrity Century? 2. What time shall we schedule the hired driver to appear at the pier, holding up the sign with our name based on a projected time the ship will be cleared for dismemberment? 3. What is the procedure for acquiring a visa, which based on our research is provided at the time of entering the country of Belize, not online at an earlier date? Will they in fact grant us a visa for 2 1/2 months? 4. What is the process with the Belize Immigration Department? Will they go through our bags? (We didn't purchase anything aboard ship). 5. Will our scheduled driver have a large enough and reliable van (as promised when we booked) for the four hour drive to Placencia? Will we arrive at the dock at 12:30 as scheduled? In an effort to be proactive on Sunday morning I visited the customer service desk to review the process of getting the above four items addressed. The staff person tried to dismiss my concerns saying all would be fine. Ha! This is not the answer I was seeking! (Tom and I agreed to let me handle these kinds of potentially testy situations. I tend to stay calm and pushy at the same time). After the staff person attended to the answer to Question #1, I was able to secure two PRIORITY TENDER TICKETS, enabling us to choose a time to get onto the tender with support staff. This helps. Unfortunately, when I pressed for the remaining answers, the staff person was unable to answer, preferring to say again, "everything will be fine. Nothing to worry about." "Yes," I said, "there is something to be worried about." She straightened the lapel on her navy blue blazer, wincing at my comment. "Let's say we get into Belize with immigration and 2 1/2 months later, we're stuck in immigration for 24 hours or more trying to "get out of Belize" if we didn't have a proper long term visa. (A visa for Belize is not required for under 30 day visits). "We need immigration to meet us at the pier," I insisted, "to provide us with a visa good through April 9, 2013, when we depart." (We had tried to get this ahead of time but was told by Belize Immigration to get a visa when we arrive). "Whatever you need to do to arrange this is imperative." I continued. "If you don't know the answer, please direct me to the staff member who does handle these types of concerns. Is there such a person on board?" "Yes," she said meekly, "I'll call her and she'll contact you." "OK," I said, feeling frustrated, "We'll watch for a message from her by the end of the day today. We spend little time by the phone in our cabin." By the time I walked over to Tom who was sitting in a lounge area waiting for me, I had cooled off enough to tell him what transpired, reassuring him that all will be taken care of and not to worry. When passengers get off of a cruise ship, returning after a day of spending money in their city, there is little, if any hoopla. Getting off the ship and staying for an extended period is an entirely other matter. Once we hear back from the on board immigration handler, we will report the results. Hopefully, all will go smoothly. A few hours after writing the above, we returned to our cabin with a phone message from Jennie, the on board Celebrity immigration officer. Immediately returning her call, she suggested I bring our passports and our itinerary to the customer service desk and she'd meet with me. I couldn't get down there quickly enough, leaving Tom behind in the cabin. As I dashed to the elevator, it dawned on me that this was the first time since January 3rd when we boarded the Celebrity Century, that I was out of Tom's sight. I chuckled to myself. Imagine. We aren't sick of each other yet! Meeting Officer Jennie put my mind at ease. Her crisp white and black uniform with epaulets, the official name tag as "Chief Officer of Immigration" coupled with her professional demeanor immediately reassured me that we were now in the proper hands. Showing her our lengthy itinerary set the pace for a lively conversation with her enthusiasm to ensure that everything goes smoothly in our early departure from the cruise. She handed me immigration forms to complete, made a copy of our itinerary and immediately addressed all of our concerns. She suggested that she'd hold onto our passports until Tuesday when the Belizean Immigration Officer will board the ship (also via tender). She'll handle everything for us including arranging for our 2 1/2 month visa. Should there be an entry fee, she will let us know and charge it to our cabin. She answered all of our questions including the seamless handling of our bags via porter to our cabin, taking our bags to be handled by the tender staff who again will assist at the pier. She said there is no need for us to so much as touch our bags. No luggage tags are needed since we'll be the only passengers staying in Belize. In addition, she explained that our having PRIORITY TENDER TICKETS, we can board the tender at any time we'd prefer. Contacting our private van company in Belize by email today, they reassured me on the vehicle's good condition, the size of the van and that the driver would meet us to be at the pier at 12:30 PM holding a sign with our name. According to Officer Jennie we'd have no trouble being there on time for the driver. On Tuesday morning when the ship anchors in the harbor of the port of Belize at 10:30 am, requiring one hour to be cleared, we'll have our bags down by the gangplank ready for us to get on the tender. Jennie will call our cabin instructing us when to come down to the desk to retrieve our passports and our new visas and head to the tender, knowing that our driver is scheduled for 12:30 PM. Anything could go wrong and throw this plan into total chaos. There is absolutely nothing WE will do to throw it off. However, we're subject to the responsibility and timing of others. As we all so well know, we can't always count on the diligence of others, only on that of ourselves. Then, of course, is the four hour drive to Placencia only after the driver takes us to the FEDEX office in Belize City to return the XCOM Global MiFi device which won't work in Belize. They are aware of the slow return mail and aren't charging us for the time it takes for the package to get back to San Diego, California. We'll need the device again by April 9th. We'll have to pay the international shipping charge back to Belize so we can collect it at the same FEDEX office in Belize City before we depart on cruise #3 back to Miami for a same day departure of cruise #4. At the cost of $395 a month for the device, it made no sense to hang onto it for this extended period. Postage both ways will be about $140. Details, details, details! The perception that this adventure of ours is comparable to a long vacation is delusional. This is work, lots of work and endless planning. Fortunately, I find the process is pleasurable and much to my surprise, Tom does as well. We are both reminded, each and every day, to enjoy the living in the moment, even when it entails a phenomenal number of specific events falling into place. We'll see how we feel about this premise when its 7:00 PM Tuesday night, arriving in Placencia in the dark, tired, hungry, opening one particular suitcase that has no clothing inside, taking out the multiple allergy and bedbug protecting mattress covers, putting them on the mattress, box springs and pillows all before we open our other bags. We shall see and of course...report how it all goes. Yesterday, while we were docked in Colon, Panama again staying onboard, we realized it was time to go online to book a few hotel reservations. We had a strong signal with our XCOM Global WiFi and decided to take advantage of the it. Now, today, we're in Puerto Limon, Costa Rico, comfortably seated in the Sky Observation Lounge in the bow of the ship, hoping to get a better Internet signal with our XCOM Global MiFi, while we notice a number of passengers getting off of the ship, walking the mile long parking lot and subsequently returning to the ship. Apparently, there was nothing to see from this location. The few offered excursions included a bumpy bus ride to "touristy" shopping areas at the cost of $49 per person. Why spend money to spend money on items we don't need or want? As mentioned earlier, we had no problem visiting a few of the same ports we experienced earlier in the month on our journey through the Panama Canal. We love cruising and visiting two of the same ports in the past three weeks was no different to us than if one was on vacation and awoke in the morning to the same view as the prior day. No big deal, right? On to our hotel reservations. Requiring reservations on two separate nights, May 5, 2013 and June 3, 2013 in Barcelona while we're between cruises, it was time to book these after we had made our airline reservations from Dubai back to Barcelona with Emirates Airlines last weekend while in Florida. As a pleasing point to us, the above first two cruises, beginning on 4/9/2013 and 4/13/2012 respectively, are on the same ship and in the same cabin. The next two, beginning on 4/20/2013 and 5/1/2013 are also the same ship, same cabin. This translates into a 10 day stint and a 15 day stint moving only once in between. We felt lucky to have been able to do this. But, after meeting many people aboard ship, apparently avid travelers often book cruises back to back to avoid moving luggage and for the purpose of extending their experience on one particular ship. Ideally, we wouldn't have these nights in between the cruises but based on the advice of our cruise guy, Joaquin, at Vacations to Go, it was too risky to plan to get on another cruise on the same day when subject to an airline reservation. This is the case on the return flight to Barcelona from Dubai on June 3, 2013. The earlier date in May was simply an extra day in between two cruises. That was as tight as we could book these particular two cruises. Yesterday, off to Expedia.com we began a search for an affordable highly rated hotel in expensive Barcelona our criteria being: close to the pier, free WiFi (which we may not need if we have our trusty MiFi), rated four stars or more by Expedia reviewers. We lucked out! Our first reservation for May is $166 a night and the second in June is $140 (both with taxes) and to boot, with a 4.7 our of a possible 5 star rating. We couldn't be more thrilled. Earlier today, while looking online for a storage facility in Barcelona to store our excess baggage during our trips to Dubai, Kenya and South Africa (when we'll have no choice but to fly), I stumbled across a few travelers who had worked with a number of hotels in Barcelona which were willing to store luggage for a fee for extended periods. This would be ideal with Barcelona as a central location for many of our comings and goings. If we can't convince the hotel to store our bags, there is a huge self service storage facility less than five miles from the hotel. As time approaches and we have a better feel for what we'll need in our luggage, we'll decide if its worth storing two or three large bags or paying for excess baggage fees. We don't fly until May leaving us time to figure it out. Check out this link for the Grums Hotel in Barcelona for our two separate nights. We opted for non-refundable reservations for both nights in order to save almost $100. How did people travel the world without use of the Internet? Somehow, they managed, making endless long distance phone calls, using the services of travel agencies, all the while booking directly with each establishment. The time saving benefits of using the Internet makes this experience much easier for us. However, in any case, it still requires an enormous amount of advance thinking and planning. A few night ago at dinner we spoke to a couple, perhaps a few years older than us, who said they'd spent days planning this single cruise. They asked, "How in the world did you book one location after another, keeping it all straight?" The answer is clear to us...bite sized pieces coupled with precise record keeping with absolutely NO RISK of losing the records by storing them in multiple locations. In our case, we've stored all of our records (and photos) in Dropbox of which we each have separate accounts, local copies on the desktops of each of our computers and in each of our Outlook and Gmail accounts. In addition, my new Windows 8 laptop has the cloud Skydrive where we also store copies. Thus, if both of our computers were stolen, all of our records (and photos) would be readily available online in our multiple accounts. This gives us considerable piece of mind. Wherever we may go, whatever plans we may make, there will never be a time as we continue to travel the world, that we can stop being mindful of the next location. Luckily, we both enjoy the process. Tom may not do as much of the searching as I do but his suggestions and input is equally valuable to us in the process. Is it overwhelming? Not at all. For me, its not unlike grocery shopping. If we like homemade food, we make a list, plan meals creating a menu for the week, whether written or in our heads. I've never tired of grocery shopping. Each time I walked into the same or a different grocery store, I was challenged by the opportunity to make delicious and varied meals that we or our guests would enjoy. Its the same with planning our next step in the journey; make a list of that which we desire to do, first consider our existing itinerary, plan a budget, do some research to determine if it is possible and affordable and then...begin booking, all the while documenting the results. Actually, I do miss grocery shopping. After almost 23 days aboard ship with every meal prepared for us, it'll be time to dig out that little skillet I stuffed into one of our bags and start cooking again. In a matter of a mere three days from today, we'll be tucked into our little beach house in Placencia Belize figuring out how to get a ride to the grocery store to purchase our first week's groceries. Wonder if they'll have grass fed meat, organic vegetables, coconut oil, free range chicken and eggs. In order for us to get to Belize by cruise ship, we've had to repeat a port of call of Cartagena, Columba, along a similar route on the cruise through the Panama Canal. We knew this when we booked the two back to back cruises. Since we're using cruises as a "mode of transportation" where possible, this didn't concern us at all. We've decided to stay on the ship rather than take one of the over-rated expensive excursions all of which ultimately end in shopping which neither of us cares to do. We could wander off on our own but, we heard stories of muggings and pickpockets near the cruise ships ports-of-call. It's open season for thieves when passengers wander off on their own on foot from the pier. Content with our decision to stay behind, we especially enjoy the time on the ship when half the passengers are off on the various excursions. There's plenty of seating at the pool where we'll wander off to shortly to work on our 45 minute a day tan while enjoying the poolside band, mostly oldies from our youth. They played to the crowd when aboard ship are seniors, like us. Last night, we opted for a late dinner, instead going to the show in the Equinox Theatre at 7:00 PM. Much to our surprise the entertainer, Jack Walker, a fabulous performer from Las Vegas was on this ship doing the same show he had done on the Celebrity Century. We'd watched his show two weeks ago! Upon entering the theatre early to ensure we secured good seats, we stopped him as he entered the theatre to tell him we'd watched his show on the Celebrity Century only two weeks ago to which he was delighted and surprised, apologizing that we'd have to sit through a repeat of his earlier show. Tom made me laugh, when he said to Jack, "Jack, we're groupies following you around the world!" We all belly laughed. The show was equally entertaining a second time. Ending at 9:00 PM we were both ready for dinner and sauntered to the Silhouette Dining Room passing through the casino on the way. We have yet to waste a dollar on gambling, although it's tempting when hearing the sounds of the clanging machines. We have a few "Captain's Club" gambling coupons we've yet to use fearful that once we'd lose that, we'd be inclined to keep going..
We have a lot of world to visit. Wasting our funds on gambling seems pointless and foolish. As we walked though the casino we talked about the unlikely possibility of winning in a casino and the natural human behavior to continue gambling until the "winnings' are gone. Its irresistible. We only know one person who is continually "ahead" of the game, playing smart poker, leaving the tables when losing, not getting emotional about winning or losing. He knows who he is. That would not be us! Thus, we stay away. As you read this post, you might say, "Good grief, these two are conservative!" You know what? There's nothing conservative about leaving everyone you know and love, getting rid of everything you own, being car-less, homeless and stuff-less. We're new at this. We've decided to pace ourselves, physically, financially and emotionally. As we experience more and more over time, we'll spread our wings always striving to make financial, security and physical safety a priority. Shortly after 9 PM we were seated at a cozy window table for two, white linen napkins placed on our laps as a flurry of servers scurried around us: cocktail waiter, wine steward, waiter's assistant, tuxedo dressed waiter and then, the head maître d whom we've come to know these past few days. There was little on the menu in the way of appetizers or entrées that fit my strict diet. The waiter insisted they will make anything I want. I opted for an appetizer seafood platter with sautéed scallops and shrimp on a bed of cabbage and arugula with grilled grape tomatoes, again a tangy Caesar salad minus croutons and grilled salmon accompanied by my usual plate of steamed buttered vegetables. Tom continues to surprise me when he ordered the seafood risotto appetizer as well as the butternut squash soup Oh my, all these years I've suggested he try new foods, falling on deaf ears. Now, he tries and enjoys everything put in front of him. Almost every night at dinner, as he spreads his epicurean wings, he asks me if I'm mad at him for turning down all the fancy foods I prepared for myself I am thrilled he's trying them now. As the dessert menus were handed to us, the waiter in the tuxedo said, "Madame, Chef Xavier has a dessert for you." Tom ordered the Tiramisu. Moments later, the waiter appeared with Tom's traditional Tiramisu, setting it in front of him and then grinning from ear to ear proudly placed a bowl of low carb, gluten free, grain free, starch free, sugar free Tiramisu in front of me. Looking up at Tom from what appeared to be a bowl of pure wonderfulness, we both smiled at the same time. Yes, this is heaven. And yes, it was delectable. Pastry Chef Xavier and Jess. We shared "foodie" tidbits! He's determined to make me a special dessert. We aren't the type of passengers or customers to complain. If our steak is too well done, we may politely ask for a new one if the restaurant is not too busy. But more often than not, we eat it anyway, content to be together having a meal, even if it isn't perfect. Since beginning this strict way of eating 18 months ago, I have been sensitive to avoid making a spectacle when ordering food, seeking out appropriate options by carefully perusing the menu and by asking the waiters to question the chef if necessary. Aboard ship for almost 18 nights with approximately 36 meals eaten thus far (we only eat two times a day) we've had plenty of opportunity to discover which foods fit the guidelines of my strict diet (Tom's less strict than I, especially on these cruises). For me, it's a matter of feeling well or feeling sick. No will power needed for that! For Tom, lately he feels well no matter what he eats and although he's gained back a few pounds, once we get to Belize with our home cooking, he'll return to my way of eating losing the extra poundage in a few weeks. The only part of the meals aboard ship that has been a little hard to resist, has been watching the fabulous desserts come out to our shared table each night, taste tempting plates of elegant fruit or chocolate sauces, drizzled or slathered over varying types of cheesecakes, mousses, cakes and pies, all of which, in my old life, I would have enjoyed immensely. Each night, the thoughtful waiters have attempted to lure me into ordering a "gluten free" desserts of which there are two options. Try to explain the restrictions of my low carb, sugar free, grain free, starch free, no processed food diet to a broken English speaking overworked waiter is impossible. As a result, when they've graciously tried to accommodate me, I've gently refused instead asking for the imported cheese plate (minus crackers and fruit) even if I had nary a bit of room in my stuffed belly after an otherwise satisfactory meal of a protein, salad and steamed vegetables. Doing so seems to pacify the waiter that he's done his job leaving me content with the offering. Invariably, the cheese plate arrives with a smattering of dried and fresh fruits which I discretely put aside without comment, consuming the tidbits of cheese in a mere minute, thoroughly enjoying the tangy flavors. When booking all of our cruises, we've chosen "Select Dining," an option whereby we can eat at anytime from 5:00 PM to 9:00 PM in the main dining room. Celebrity Equinox's Silhouette dining room is an elegant massive two level white linen dining room with waiters scurrying about in tuxedoes and a white towel neatly draped across their arm. With this choice, we can eat alone at a table for two or eat at varying configurations, round for six or eight or rectangle for up to 10, sitting across from one another. This shared dining has been delightful, each night meeting new table mates, when lively conversation ensues in most cases. On a few occasions, we observed our newly found dining companions to prefer to remain quietly to themselves which we respect, instead talking and enjoying the time among ourselves or with people on our other side. Most often, passengers choosing to sit with others do so to enjoy meeting new people. The other dining option is a fixed dining time of either 6:00 PM and 8:30 PM at the same table each night of the cruise, sitting next to the same people, night after night. Risky. Plus, we're attempting to live of life of doing exactly what we want to do, when we want to do it. Selfish, perhaps. Nonetheless, immensely fun. If we miss out, so be it. We'll figure out an alternate plan. Anyway, back to last night. We were seated in the elegant lower level of the dining room as opposed to the main level when we didn't have a reservation. The maître'd has taken a liking to us. As a result we've only had to wait on one occasion for more than a few minutes for a table. If there was a long waiting line we waited in the "ice bar" enjoying a beverage until the maître'd informed us that our table was ready. Upon being seated at a rectangle table for eight, closest to the wall (not ideal), our penguin dressed waiter rushed up to me and for some unknown reason, was aware of my diet restrictions. Had the word spread that the tall, dark haired, older woman with the adorable grey haired guy was gluten free along with other goofy restrictions? He ran circles around me. Tom, preferring not to draw attention to himself, more than that which he accrues being endlessly chatty and humorous, slithered down a little in his chair. I chuckled. This was proving to be VIP service, none of which we requested or expected. Ordering a Caesar salad minus croutons, a giant rare rib steak, buttered al dente asparagus and a platter of steamed non-starchy vegetables, I was content. Oh, no. I wasn't getting away that easy! When I refused dessert, shocking our attentive waiter and not wanting to "hurt his feelings" I explained that I was on a strict diet for health reasons. I gently explained that there was nothing I could eat other than the ol' standby cheese plate and that I was quite content (although I was actually tired of it already). The waiter dashed off before I could say another word. In moments, Chef Xavier, pastry chef extraordinaire, white tower hat atop his head of curly brown and grey hair, crisp white uniform spotless and neatly pressed appeared at our table, insistent in a delightful accent I couldn't quite decipher, that I give him a list of every item I couldn't eat. Paper and pen in hand, he was determined to prepare a special dessert for me to enjoy each of our five remaining nights aboard the Celebrity Equinox, until we disembark early for our extended stay in Belize. A little embarrassed by all the attention I quietly spewed the list of items I must avoid commonly used in baking. He asked many questions on the items I could have. It was obvious, when I tried to refuse his generous offer that he loved the challenge when his usual days and nights consisted of creating the same "cookie cutter" desserts for the 11,000 meals served each day. Tom took the above photo of Chef Xavier and I table side. The favorite maître'd, observing this scenario insisted that he'd find us tonight and each upcoming night taking down our names and cabin number. I suspected that their sophisticated computer system could easily locate us after we check in for dining. So, I look forward to a new dessert concoction tonight and nights to come. I told Tom that even it doesn't taste fabulous, I'll eat it anyway and enjoy it knowing that the thoughtful consideration in itself whet my appetite. Thanks Chef Xavier. Your kindness adds yet another memorable event to our year's long journey, so rich in its content and already becoming so rich in the experience of the meeting new and interesting people along the way. To say the Celebrity Equinox is larger than the Celebrity Century is an understatement. With a capacity for over 2800 passengers, as compared to the 2000 on the Century this seems as if it's twice the size. Everything is huge! Banks of elevators line the halls, support staff at every corner, restaurants, theatres, two outdoor and one indoor pools with amenities for every age group abound. Its daunting! Our Concierge Class cabin is more exciting than we imagined. After reading a few reviews at www.cruisecritic.com we anticipated that the upgrade was barely worth the extra fare. Ha! We're in heaven! Speaking of heaven, last night, during our elegant dinner in the Silhouette Dining Room, the main formal dining area, Tom left me in stitches. Looking at me with a twinkle in his eye he said, "You know what?" "What?" I inquired, anxious to hear what he had to say. "Today is the one month anniversary of Mayan calendar's end of the world," he said with a huge grin on his face. "Oh, that's true," I agreed, anticipating his next comment. "And I was right," he said. "The world did end and we've died... and gone to heaven." We both laughed aloud. He was right. This is heaven. And no, we don't expect this glorious feeling to last forever but while it does we'll relish in every moment. When it changes and it will, as it does when one first falls in love later settling into a familiar and comfortable feeling, we'll accept and welcome the familiarity of our ever changing lifestyle along with the consistency of our relationship. Our cabin is larger this time at 196 square feet as opposed to 186 on the Century, a seemingly small difference that provides us with a full sized sofa so we don't have to lie in bed when lounging. Packing and unpacking smarter this time, it took us only an hour and a half to unpack yesterday as opposed to several hours when we boarded the Century only nineteen days ago. I knew we'd get better at this! Again, Tom handled it all so well. After we arrived onboard we wandered each of the multiple decks of this huge ship checking out all the activities, the 10 restaurants, the pools and Jacuzzis, the library, the Internet center and the 13 bars and lounges. 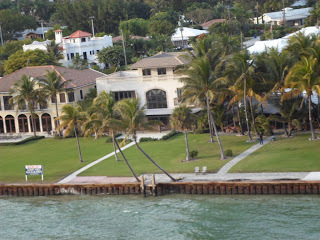 Last point in Fort Lauderdale as our ship sailed out to sea yesterday afternoon. Returning to our cabin a few hours later, we were delighted to find a bottle of chilled sparkling wine, a platter of elegant canapés, fresh flowers, discount coupons, personalized stationery and our awaiting Cabin Steward, Juan, anxious to welcome us explaining options available to us. If we so choose, we may order room service, snacks, desserts or drinks 24 hours a day at no extra charge. Tips, although already included in our fare, are expected by waiters, cabin attendants, bartenders and other on the date of departure (which in this case will be next Tuesday, the 29th when we disembark early to stay in Belize), as we've learned from other seasoned cruise passengers. Based on the quality of service we experienced thus far, we have no issue with this. We've also included additional tips in our budget. On board only 24 hours, we've already spent $254.64. This includes cocktails and tips last night, $199.95 for our minimal Internet package and $29 for a nifty pair of Steve Madden sunglasses for me (been wearing the same $10 pair of Target sunglasses for the past nine years). We had received a $100 on board credit so at the moment, our bill is $154.64. Only additional charges that we anticipate going forward will be beverages and additional tips. We don't fall prey to all the "extras" aboard ship. The 17 appealing high end shops are fun to investigate but offer no temptation for us. There are enough included activities and of course, casual and fine dining. Today for fun, we perused the menus of the "extra cost" restaurants, of which there are five. None of them appealed to us to justify the extra expense. Most of the foods wouldn't work for my limited way of eating or were very similar to the offerings in the main dining room, the Silhouette, an Old Hollywood style formal dining room as I mentioned above. After traveling on the Celebrity Century for 15 days, we were upgraded to the Captain's Club with three credits for "Classic" status. The ideal is "Elite" requiring ten credits, a long way away based on the fact that our remaining six cruises are on other cruise lines. Arriving in our cabin, we expected documentation stipulating our Captain's Club status. Alas, there was none although we'd received an email from Celebrity with our membership numbers only two days ago. Determined to reap the benefits of the multiple cruising status, we marched off to Guest Services last night before dinner, diplomacy in hand, requesting our new Sea Pass cards (both a room key and on board charge card linked to our credit card) which should have been gold with a Captain's Club designation. We were politely informed that the staff in that department wasn't available until this morning. Unruffled, we sauntered off to dinner leaving the task for the morning, along with the required "lesson" in the Internet center as to how to log on and off their somewhat complicated system to ensure we weren't charged for minutes we weren't using. (This was different than on the Celebrity Century for some goofy reason). After breakfast this morning we headed to complete our "tasks," which definitely was not as good as on the Celebrity Century...coffee was too strong, the smoked salmon too vinegary, too long a line for real poached eggs, the bacon was too fatty, blah, blah, blah. (No whining allowed. We ate our breakfast, chatting with a delightful couple from England on their 14th cruise). Off to the Captain's Club office with a 20 minute wait in chairs, a gracious young woman surprised to see we had "documentation" on my computer stipulating that we are in fact Captain's Club members, our new Sea Pass cards were issued, we were handed a ton of printed materials along with a coupon for 10% off for Internet services we could drop off for credit. Finally, we could get online to check email, Facebook and post on our blog and look forward to a private party for Captain's Club members upcoming on Thursday. Tonight is formal night. We goofed, failing to make a reservation for dinner in the main dining room, leaving our only option for 8:30 PM. If we want to see the "show" in the Equinox Theatre, we'd have to attend the production at 10:45 PM tonight, a little late for me, although not Tom. Perhaps, I'll drink something with caffeine and try to stay awake, early bird that I am awaking at 5:30 am this morning as usual. Maybe it's time for me to rearrange my hours to coincide with Tom's, who prefers to go to sleep late and wake up later. Hummm...us retired folks...eat early, bed early, up early. I need to get a grip! I use the excuse that I'm five years older than Tom. Lying in the warm sun on our patio at noon, we soaked up some rays as the ship began the journey past Cuba. A class, again offered by the Smithsonian Institute, entitled Beyond the Podium with James Karr, a retired college professor from Washington, on "Volcanoes, Connect Continents and Spawn Magical Webs of Life." Very interesting! More classes to follow. We love these! Now back in the cabin, I write this at 4:30 PM. Many have questioned the need for our excess baggage. As we move from spot to spot, we've realized the benefit of the items we have brought along. As we continue, we'll either leave behind or ship some items back to the US which we don't use or need. It's a learning process that we'll fine tune as we go along..
Today, our "stuff" served us well. Tonight, being formal night, we had carefully packed our dressy clothes in the few bags we needed to open for this cruise, one for each of us plus toiletries. Scrounging around in another suitcase, we pulled out our new unopened clothing steamer. Our clothes for tonight were wrinkled messes. Yes, we purchased low wrinkle fabrics as much as possible. But Tom's Hugo Boss suit and recently washed wrinkled proof dress shirt were a mess. My dressy dress was also riddled with wrinkles. Reading the directions, it looked easy enough. Minutes later, the trusty little steamer was spewing hot steam and I couldn't wait, laundress that I am, to get my hands on it! In a matter of minutes, not only were our clothes for tonight wrinkle free but I also "unwrinkled" outfits for both of us for tomorrow night's less dressy evening. In totaling the cost of having the same items I done by the ship's laundry service, we saved $34.65. It took me less than 20 minutes. It more than paid for my Steve Madden sunglasses. Love the steamer! Our appetizers will arrive in a few minutes. We'll make a drink (somehow we managed to get Tom's bottle of Courvoisier aboard without question), I'll have an icy mug of Crystal Lite iced tea and we'll meander out to the balcony, plop down in the comfy chairs and begin yet another night in heaven. Our cruise bill...our last full day aboard ship..